Woody vines; stipules minute, triangular, borne on petiole at or slightly above base; petiole bearing 2–4 (–8) small glands in 2 rows; lamina bearing few to many small glands impressed in abaxial surface in a row parallel to but set in from the margin. Inflorescences terminal and lateral panicles with the flowers borne decussate or distally irregularly in short to elongated pseudoracemes; floriferous bracts eglandular; floriferous peduncle well developed; bracteoles eglandular, borne between middle and apex of peduncle or near apex. 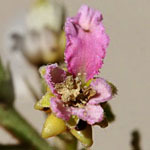 Sepals valvate, completely concealing petals during enlargement of bud, recurved in anthesis, the lateral 4 biglandular, the anterior usually eglandular; corolla bilaterally symmetrical to almost radial; petals white, white and pink, pink, or lilac, spatulate, abaxially densely tomentose or subsericeous, adaxially glabrous or sparsely tomentose, especially the lateral 4; androecium radially symmetrical; stamens glabrous; filaments 1/3–2/3-connate, straight, ± alike; anthers alike; gynoecium radially symmetrical; ovary with the carpels completely connate; styles 3, straight or nearly so, subequal, laterally somewhat flattened distally, dorsally rounded, truncate, or apiculate at apex, the stigmas internal. Samaras separating from a short pyramidal torus; samara suborbicular or transversely elliptical, the lateral wings membranous or chartaceous with distal looping anastomoses, cleft to nut at apex, usually continuous at base (rarely cleft to nut at base), the margin usually entire or undulate; dorsal wing distinct at apex, distinct at base or very abruptly confluent with lateral wing; intermediate winglets none; ventral areole ovate. Chromosome number: Lombello & Forni-Martins (2002, p. 246) reported n = 30 and 2n = 60 for A. anisopetala (as Mascagnia anisopetala); W. R. Anderson has not had the opportunity to verify the identification of their voucher. Alicia is easily distinguished from the related genera Callaeum and Malpighiodes by the combination of glands in the abaxial leaf surface (vs. on the margin), flowers borne in pseudoracemes, and densely hairy white/pink/lilac petals that are completely concealed by the sepals during enlargement of the bud. In A. anisopetala and some populations of A. macrodisca (Triana & Planch.) W. R. Anderson the petals are strongly dimorphic, with the posterior petal much larger than the four lateral petals, which makes those plants quite distinctive. Reference: W. R. Anderson (2006b, pp. 174, 176–177), partial revision: description of genus, key to species, nomenclature of species, but no descriptions of species (Alicia only: pdf; entire paper: pdf); unpublished notes on species of Alicia. Etymology: The name Alicia honors the French botanist Alicia Lourteig (1913–2003).